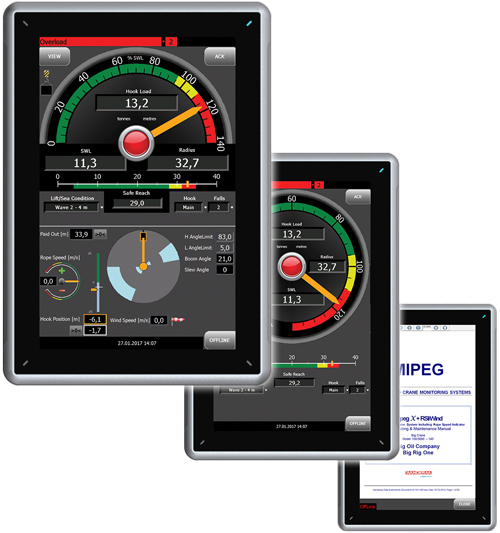 The Mipeg X system uses a graphical color, touch screen display. The unit is programmed and operates as a highly flexible and expandable unit. The Safe Load Indicator (SLI) features also referred to as Rated Capacity Indicator (RCI) or Load Moment Indicator (LML) showing Hook Load, operating Radius, Safe Working Load (SWL), Lift/Sea Condition, Crane rigging etc. Details of the various display features and parts are described elsewhere on this web page. MIPEG Slew Operation Limit Monitor warns the operator if entering into limit sectors, keeps track of maximum slew positions and can provide anti-collision warning signals. State of the art strain sensor utilizing a unique, frequency based method.